"Terry's style is always direct, approachable, and pragmatic. Abstraction is hard, and visualizing abstractions is as well, but here she'll guide you in doing both using Rational Software Architect. 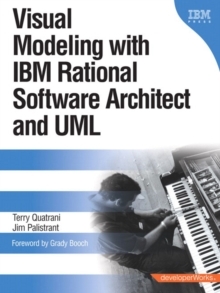 "-From the Foreword by Grady Booch, IBM FellowMaster UML 2.0 Visual Modeling with IBM Rational Software Architect Using IBM Rational Software Architect, you can unify all aspects of software design and development. It allows you to exploit new modeling language technology to architect systems more effectively and develop them more productively. 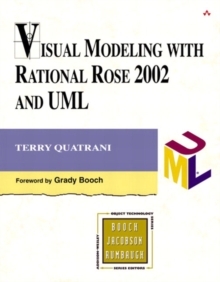 Now, two of IBM's leading experts have written the definitive, start-to-finish guide to UML 2-based visual modeling with Rational Software Architect. You'll learn hands-on, using a simplified case study that's already helped thousands of professionals master analysis, design, and implementation with IBM Rational technologies. Renowned UML expert Terry Quatrani and J2EE/SOA evangelist Jim Palistrant walk you through visualizing all facets of system architecture at every stage of the project lifecycle. Whether you're an architect, developer, or project manager, you'll discover how to leverage IBM Rational's latest innovations to optimize any project. Coverage includesMaking the most of model-driven development with Rational Software Architect's integrated design and development tools Understanding visual modeling: goals, techniques, language, and processes Beginning any visual modeling project: sound principles and best practices Capturing and documenting functional requirements with use case models Creating analysis models that begin to reveal your optimal system implementation Building design models that abstract your implementation model and source code Using implementation models to represent your system's physical composition, from subsystems to executables and data Transforming these models to actual running code The IBM Press developerWorks (R) Series is a unique undertaking in which print books and the Web are mutually supportive. The publications in this series are complemented by resources on the developerWorks Web site on ibm.com.